I wonder what happens when you put these three unlikely mammals together? You get the Ice Age Trio! This film is one of the greatest animated comedies I’ve seen. It’s all about creatures going on a migration to the south because of the Ice Age. This hilarious Trio come together all because of a baby, who they try to take back to its family. Through their journey together they become friends and learn what it means to be in a herd. So not only do we learn about mammals in Ice Age but it also gives a good insight into what it really means to have a baby and how much of a responsibility it is to look after it and ultimately, how it brings people closer together as a family. It also shows how even the mammals with most different personalities always seem to come together and became great friends. This film still has all the comical lines – when Diego says to Sid: “I don’t eat junk food,” and when Diego says to Manfred: “That pink thing is mine”. The humour is amazing in its childishness but also has an undercurrent of being threatening – in joking way. 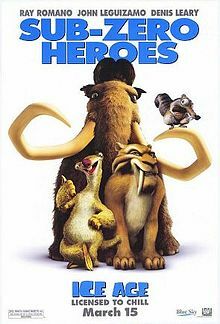 Ice Age tells us a lot about the history of our world and how we evolved and interacted with animals. It reminds us of the difference between children and adults and of how an adult is seen as being threatening to animal, but to a baby, they have a different response. The reason is that a baby seems less threatening to them and they see it as one of their own. A baby is a symbol of new life to all creatures and humans. It also questions what it means to be a good friend and how saving someone else’s life changes the way you think of them which is shown in the film between Diego and Manfred. Especially when Diego decides to help them instead of kill them because he is questioning the reason for killing for pleasure. You see how strong a relationship really can be. These animals maybe just animals but they have such life like personalities for example in the way they speak and act. You can identify with them in the way you do with humans and by the end of the film you have completely forgotten that they are even animals. I can’t finish without mentioning two of my favourite characters the first is the Dodo which were the funniest of creatures alive. Their whole idea of what the ice age is and preserving their kind is actually a good idea but its just the way they go about it is hilarious. The other is the random squirrel-rat called Scrat who pops up in the film randomly doing his life long dream of trying to find a spot to bury his acorn for the winter. The fact that he never succeeds just makes me laugh. Overall this film is a ‘must see’ and is great for all the family just to have a laugh.